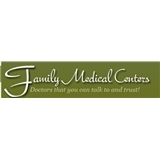 Family Medical Centers (New Port Richey) - Book Appointment Online! Family Medical Center is a primary care practice, with offices in Port Richey and Trinity, Florida. We are able to address a wide variety of medical needs for all ages from two years old up to one-hundred years old.The entire staff is committed to offering excellent medical care as well as superior customer service. Our staff of long-term employees are highly skilled at providing patients with personalized, concerned care. In addition several staff members and clinicians at Family Medical Center are bilingual, speaking and comprehending Spanish fluently. I'm not sure he was understanding what I was say to him a first!